There are varying degrees of severity for automobile accidents that occur in Burlington and throughout Ontario. Automobile accidents range from a simple rear-end collision or "fender-bender" at a stop light to high-speed, violent head-on collisions where passengers may be traumatically injured or killed. What accident victims should do in the event of an automobile accident differs very little, however, whether the accident is considered minor or of a more serious nature. If you are involved in a Burlington automobile accident there are certain steps you should take to ensure that your legal rights can be enforced should you decide to file a law suit against the insurance company of the negligent party. Although Canadians are covered by no-fault automobile insurance, there is always some fault to be allocated to one or both parties involved in the collision. It's this degree of fault that will be determined by an insurance company representative; the degree to which you are at fault will determine how much your automobile insurance premiums will go up. This potential risk to you should be considered when you loan your car to a friend or family member, as well. If your friend has an accident, it's your car insurance rates that may be affected as you lend your insurance automatically when you lend your vehicle. The following are general guidelines for you to keep in mind if you are involved in an automobile accident. The only substantial difference between major and minor may be the ambulance ride to the hospital. Even in minor accidents, all parties should wait until the police arrive and should not leave the scene of the accident until dismissed by the police. Stay where you are and do not move your vehicle. You are not required to, and should not try to move a damaged vehicle to the side of the road. If you can safely exit your vehicle, you should do so, particularly where there is any risk that your vehicle is blocking traffic and may be hit by another. If you can provide simple first aid or an item such as a blanket to others involved in the accident you are encouraged to do. In most cases, only a health care professional can safely move or help seriously injured individuals, so the best thing you can do for them is to immediately call Emergency services. Immediately locate your cell phone and dial 911. Cell phones are certainly a useful tool in the case of an accident. It is a good idea to make it a habit to place your cell phone in the glove box or another handy location every time you enter your car so that it may be easily retrieved in an emergency situation. Do not give your phone to anyone, and do not call anyone else at this time. Calling the police in the event of an automobile accident is mandatory and the timeliness of your call can save lives more than any other thing you can do at this time. Seek immediate medical attention. In most cases, an ambulance will accompany the police to the scene of the accident or very soon after. Accident victims should get to a hospital as soon as possible even when injuries are believed to be minor. The extent of your injuries should be documented in writing; this will increase the likelihood that you receive the best medical attention possible and also, will help your case if you choose to initiate a negligence suit. Sometimes the injuries you suffer will be internal such as nerve damage, whiplash or spinal cord injuries, and may not manifest themselves for days or weeks. For this reason and also to prevent injuries from potentially worsening, it is important to undergo a thorough medical assessment immediately following the accident. Do not talk with the other party involved in the accident. The other driver may attempt to get you to verbally agree that the accident is not their fault. Rather than discussing the conditions leading up to the accident with the other driver(s), call the police and permit them to gather witness accounts and document the accident in writing. Give the police your side of the story truthfully and accurately. Also, do not speak with insurance adjusters, neither yours nor the other party's. Insurance adjusters work for the insurance companies and their job is to minimize the amount of money that they have to pay out. They sometimes arrive at the scene of an accident within minutes in order to get you to make verbal statements that could be used against you in court should you decide to make a claim for damages. When it comes to insurance adjusters, this is a great time to exercise your right to remain silent. After you have taken care of high priority issues that result from the accident, such as medical treatment for your injuries and alternate transportation for your family, it is in your best interests to call a personal injury lawyer. In your first visit, your Burlington Personal Injury lawyers of Ontario (ILO) attorney can get a general idea as to who was at fault in causing the accident and whether you have a case against the negligent party. A skilled personal injury automobile accident lawyer will investigate the circumstances surrounding the accident and obtain copies of police reports, cell phone records and toxicology reports, as appropriate. 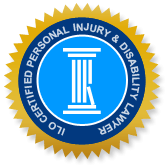 These are the documents you will need to make a case against the insurance company to compensate you for the financial costs from your injuries as well as your pain and suffering. Witnesses and documents may no longer be readily available if this investigation is delayed, so contact our law office as soon as possible. Being involved in an automobile accident can be the most traumatic time of your life. You will need all the help you can get to make it through and to restore your life back to normal, as much as is possible. It's a time when you may be suffering both psychological and physical pain and, along with your family, are experiencing financial burdens due to medical expenses and perhaps a loss of income. Our lawyers at Burlington ILO are here to help you every step of the way and will do what it takes to help get your life back to normal. Please call us today.